“We cannot control or meter free energy”. And, of course, free energy would doom the petrol and coal industries – the biggest profit machine in the history of mankind – and terminate internal combustion technology. Can we blame them for fighting free energy? And fight it they did. We have been lied to for a century by a most elaborate cover-up that succeeded in quashing all ‘public’ free energy development and convincing the World that Oil, Coal & Nuclear are the only primary fuel alternatives. Polluting Oil extraction and processing However, all that advanced free energy development did not simply get buried – it was ‘privately acquired’ and went underground into deep black opps where the brightest minds on Earth have been exploited to develop the finest free energy and anti-gravity technologies for the top elite levels of the Military Industrial Complex. It is a massive story that is slowly unfolding from 40 years of research. It really is very secret and the truth is frankly unbelievable. 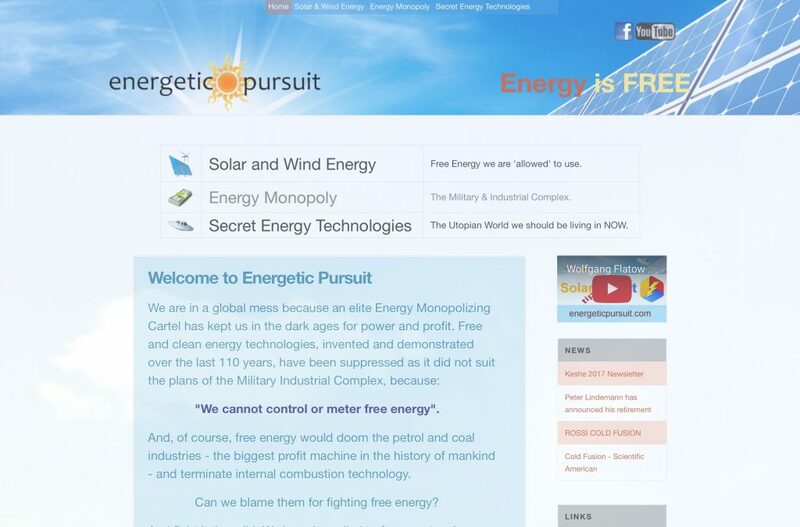 Explore the short list of some of the Free Energy Researchers, Scientists and Inventors on the right. They have all successfully discovered and proven viable ‘over unity’ energy devices. They have all been suppressed. They have discovered/invented ‘perpetual motion machines’ because they extract energy from the highly energetic quantum vacuum flux, or aether, which IS in perpetual motion, and according to quantum scientists, contains unlimited energy. Furthermore, this aether energy is electrical in nature and is readily extracted – all our generators are aether energy extractors. None of them are ‘energy from nothing’ systems. They do not need to be. The Universe IS energy, with far more energy than that released from an atom! In selling us electricity and petrol they have succeeded in selling ice to the Eskimos and water to fish. The idea that energy is rare and expensive has not been true for 100 years. The most astounding free aether energy and transportation technologies have existed on Earth for over 60 years! This web is a contribution to the global effort by many excellent researchers to reveal that truth, with the intent to penetrate the secrecy, disclose the facts and reclaim Earths scientific heritage for the benefit of Mankind, Mother Earth and our fellow creatures.